A nurse’s worst nightmare is going into a room and not knowing how to care for a patient, said nursing student Chris Mendoza. With the completion of the new simulation lab at Dalton State, nursing students, and others in the health professions, don’t have to worry about facing that fear. The simulation lab is designed to prepare health professions students for just about any situation they may face in clinical practice, and later, in the workplace. Nursing students at Dalton State have had experience working with a simulation mannequin in the past. 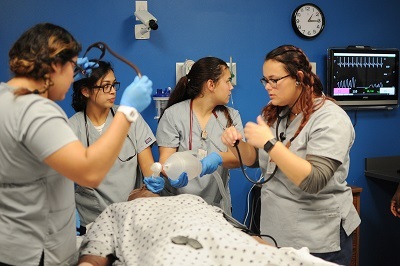 With the opening of the simulation lab this semester, students from the other disciplines – respiratory therapy, radiological technology, social work, and licensed practical nursing – have regular access to the lab as well. The lab also opens the opportunity for students in the different disciplines to work together, as they would in a real hospital setting, said Melanie McCarley, simulation coordinator for the School of Health Professions. In hospitals, nurses, respiratory therapists, radiologic technologists, LPNs, and social workers all work together for the good of the patient. But traditionally in school, working together hasn’t been practiced on a regular basis. Dalton State is changing that. The lab includes three adult simulation mannequins, one of which can mimic pregnancy for birthing simulations, and one pediatric mannequin. There is also an infant simulation mannequin that can be used in the sim lab or the nursing skills lab. The mannequins respond in real time. They can talk, breathe, bleed, and respond to what students are doing. Ms. McCarley runs the simulations from a control room. In one scenario a simulated patient had had knee replacement surgery. Nursing students were told they needed to care for him post-operatively. The scenarios become more complicated as students learn more. A blood sugar problem simulation for first-year students becomes a diabetic patient with chronic breathing problems for second-year students, Ms. McCarley said. The rooms also have equipment similar to what students will see in a hospital setting, including digital medical records, a crash cart, and IV pumps. They practice routine hygiene to prevent the transmission of infectious disease. The radiologic technology program has a lead-lined room so students can practice taking x-rays. They will have specialized equipment since the mannequins’ robotics cannot be subjected to x-rays. Social work students will have their own space to practice home visits and speak to patients in an office setting. A simulation might take about 30 minutes to complete, and afterward students watch themselves on video and talk about what they did right and where they need to improve. Then students repeat the scenario. Mr. Mendoza feared he had skipped a step in trying to get a patient to respond during a scenario. Mr. Mendoza, who is completing a clinical rotation on the cardiology unit at Hamilton Medical Center, has seen how his learning and confidence have progressed as he’s experienced more in the simulation lab. He said he was able to detect an irregular heart rhythm in a patient and make a doctor aware of it because he had experienced a simulated arrhythmia already. During an externship at Erlanger Medical Center in Chattanooga recently, Mr. Mendoza saw how his experience at Dalton State set him apart from other nursing students in other programs. The same is true for respiratory therapy students at Dalton State. Through the lab, Lovett has learned how to rely on other team members to help during times of high stress. And she’s learned the importance of communicating so they can work as a team more efficiently. The simulation lab was made possible by grants from the John Willis Mashburn Trust and the Dalton State Foundation.